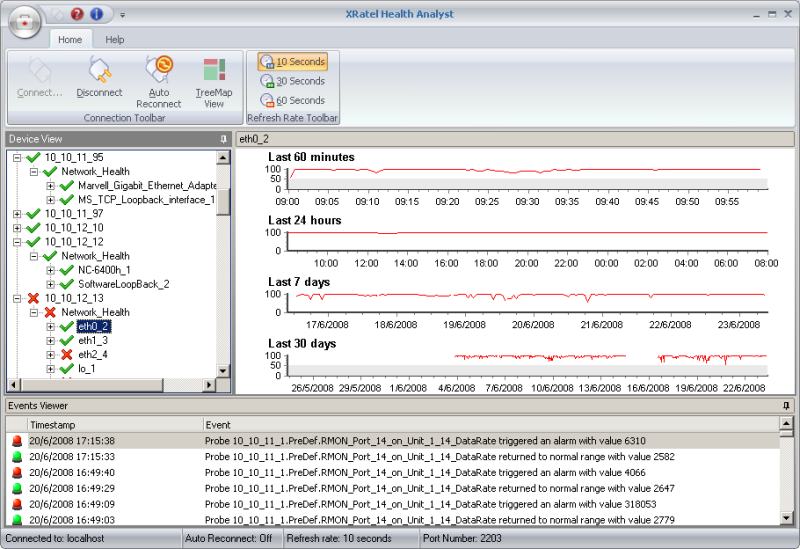 XRatel Performance Suite is a complete system monitoring solution, covering networks, computer servers and workstations. It allows users to access powerful and meaningful real-time and historical graphics, generate alarms and automatically send e-mail messages. It is easy to install and configure and there is no need to use local agents or data providers. It joins in the same product high performance, flexibility and reliability. ...... parameters as error rates, collision rates, etc. You can also monitor many other aspects of managed switches, printers, and other network components as long as they are SNMP enabled. Generating many KPIs, such as device's overall performance and Network Health, it provides valuable information for system administrators to optimize the efficiency, layout and setup of WAN and LAN links, routers, servers and other network components. It also monitors the downtime and access time of unmanageable devices. Qweas is providing links to XRatel Performance Suite 5.0 as a courtesy, and makes no representations regarding XRatel Performance Suite or any other applications or any information related thereto. Any questions, complaints or claims regarding this application XRatel Performance Suite 5.0 must be directed to the appropriate software vendor. You may click the publisher link of XRatel Performance Suite on the top of this page to get more details about the vendor.